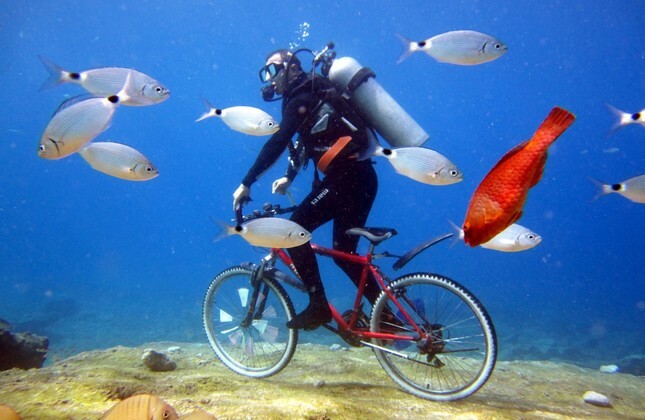 Önder Diktaş, one of the teachers at a scuba diving school in the Fethiye district of Muğla province, has mesmerized people with his underwater achievements, which include biking, sleeping, playing backgammon, getting married and working in an office. Diktaş became a successful diver in a very short time as he started diving as a hobby just six years ago. In order to contribute to diving tourism, the 33-year-old decided to arrange various activities under the depths of the blue waters and share them via social media. Speaking to Anadolu Agency (AA), Önder Diktaş said that Fethiye hosts the best diving points in Turkey and there are places where everyone, no matter what experience level, can dive in the region.He said that they developed the activities that they started as amateurs to draw attention and explained they received very good feedback for their videos that they shoot to introduce people to the world of scuba diving. "We brought a bed and blanket under the water. We worked at a desk, wearing suits. Our only goal is to introduce diving to Turkey and the world. We want Fethiye to be one the top places for diving," he said. "Diving is among the safest sports in the world. Nobody should be scared of giving this a go. We want everyone to dive at least once in their lives. Even people who have never seen the sea or put their foot in water can dive," he added. "After a little bit of training with equipment, people can dive up to five meters under the supervision of trainers," the master diver explained. Diktaş said that people can see wrecks, fishes and other underwater creatures in Fetihye as the region is a natural aquarium. "People who dive here for the first time always say that they are more than happy they did," he concluded.